I didn’t really need dinner…but I didn’t know when I would get a chance to eat again. Add that to the fact I was right down the street from a restaurant that has emotional significance to me. First, a little back story. J and I started dating five years ago when we lived and worked together in Peoria, IL. About seven months after we started dating, she got a job in Lansing. I was frustrated with my job and decided to take a chance…a chance that paid off in the end. The day after J got the job, we took a road trip to Lansing. We needed a place to live, so we went apartment hunting. After signing a lease at the apartment that made me never want to live in an apartment again, we decided to do a little exploring in what would become our new home. I was excited to live in a state capital and really wanted to go check out downtown. We drove around downtown Lansing for a little while then decided to find someplace to eat then head home. 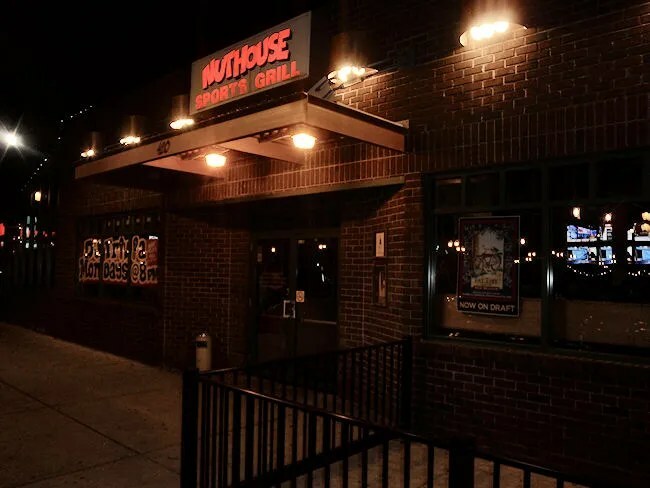 The place we found was the Nuthouse Sports Grill on Michigan Avenue across the street from the Lansing Center and Kitty Corner from Oldmosbile Park (now Cooley Law School Stadium). In addition to being our first meal in our new home, it was also the first time I had ever had bleu cheese on a cheeseburger. Once break time rolled around, I pointed a few of my co-workers down to the Nuthouse. I still had some things to do before I joined them for dinner and by the time I got done, I decided just to phone in a carry-out order. I didn’t really feel like sitting down knowing that I would get engrossed in a game on one of their many TV’s or the massive TV wall. I called in my order for a Black & Bleu Burger. I was told it would only take about ten minutes and that’s about the walk I had. By the time I walked in the door ten minutes later, my sandwich was bagged up and waiting for me. 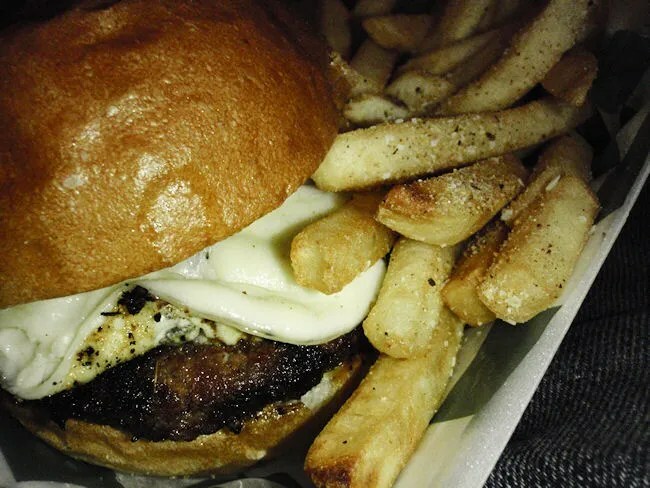 The Black and Blue Burger from the Nuthouse is actually pretty different from other places. The 1/2 lb. burger is seasoned with Cajun spices then topped with bleu cheese, Provolone cheese, lettuce, tomato, onions, and pickles. It’s served on a kaiser roll. What makes it different is the provolone cheese. The bleu cheese is placed under the provolone to keep it on the burger and it kind of tones down the tanginess of the bleu cheese. As usual, the sandwich was delicious. 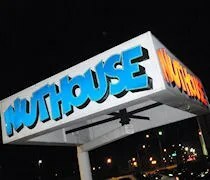 The Nuthouse was always one of my favorite places to go when we lived in Lansing and I’m happy I could share this place with some of my co-workers. Everyone who picked up a sandwich that night commented on how good it was and thanked me several times for point them in that direction.